Featuring the latest technology, these are still very new so only limited supplies available until the end of November. But you can get one right now from Story Charms' eBay auction. Supplied in a presentation box complete with software package and connection cable. 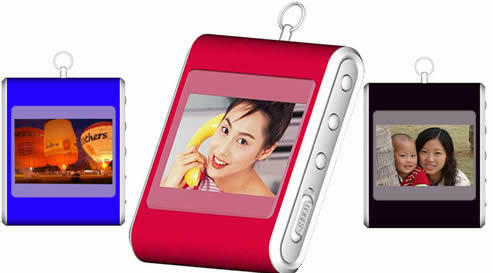 Transfer your favourite photos direct from your PC to the Mini Photo Viewer. This product is available for shipping direct to you from the UK. Next day delivery available to UK cusotmers. Display your pictures as a Mini Slide-Show with a subtle fade transition, or use the simple controls to flip between each frame. Stores up to thirteen individual images and higher capacity models will be available soon. Photos can be easily replaced using the software included. Planning a Sales Exhibition? The Mini Photo Viewer will be the most sought-after 'freebie' of the show! Are there any larger capacity versions available? If so, how much are they? This seems like a good idea for business use too, if you do something visual like train on software, design buildings, etc. Easier than lugging a laptop and projector around. Good question, thank you for asking! I am expecting delivery of larger capacity Mini Photo Viewers very soon, within the next couple of weeks. Laura, you are exactly right! This is an ideal corporate promotional gift for anyone selling products or services with a strong visual element.